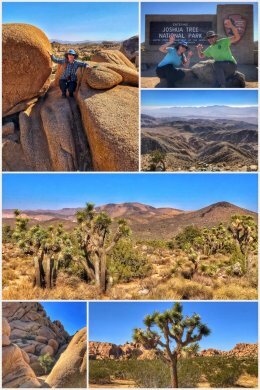 We quite enjoyed our visit to Joshua Tree National Park, located in southern California and which straddles two ecological systems — the high Mojave Desert (at elevations 3,000+ feet) in the western part of the park and the low (below 3,000-feet) Colorado Desert in the eastern part. 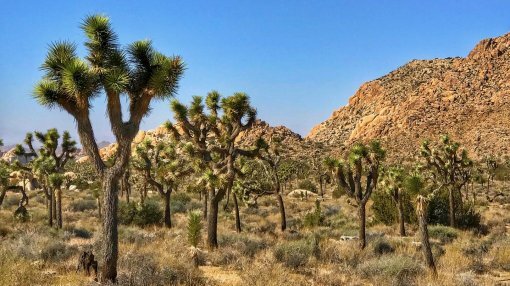 The park, established in 1994, is named for the beautiful and bristled Joshua Trees that abound (and which are a form of yucca), but the park has so much more to offer visitors, including massive boulders (jumbo rocks), rugged mountains, gold mining ruins, and desert plains covered in all sorts of flora (including the yuccas, chollas, palms, desert scrub oaks, California junipers, and pinyon pines in the western, Mojave part of the park). Officially, the park provides habitat for 813 higher plant species, 40 reptile species, 41 mammal species, and 240 bird species. The park is also a haven for nature-enthusiasts, hikers, and rock climbers and scramblers. 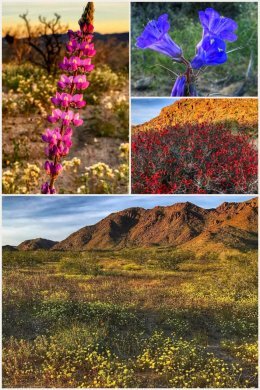 We had last visited the southern portion (Cottonwood entrance) of the park a few years ago (March 2017) to witness and catalog the amazing desert spring blooms. 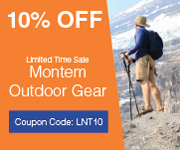 If you have the opportunity to visit after a wet winter/spring, you will not be disappointed! The park is quite different in the fall, but just as beautiful and majestic. On our current trip, we made two visits to the park, starting on Veteran’s Day — which is one of several fee-free days in national parks, and which made the park a bit overcrowded. (We are not complaining; while traffic — on the roads and the trails — is a bit of a nuisance, we love seeing people out in nature and enjoying OUR national parks). The first day at the park was more of an orientation day. We started at the Oasis Visitor Center in Twentynine Palms, one of three centers within the park. (The others are the Joshua Tree Visitor Center in Joshua Tree in the northwest corner of the park and the Cottonwood Visitor Center at the southern entrance to the park.) Alas, no movie on the park, but we did pick up a magnet, as well as get some good advice on the best hikes to conquer during our visit. We decided to drive the entire northern route along Park Boulevard, making stops wherever we felt pulled. One of those stops was for the Jumbo Rocks, which contains large boulders, desert scrub, and miniature canyons. 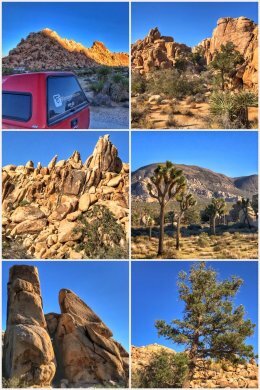 We also drove to Keys View, which at almost 5,200 feet in elevation, offers some wonderful views of the Little San Bernardino Mountains and the San Andreas Fault — and beyond. It was gusting winds up to 40 miles per hour while we visited and both of us almost got blown away. Stopping there was a crazy, but fun experience. 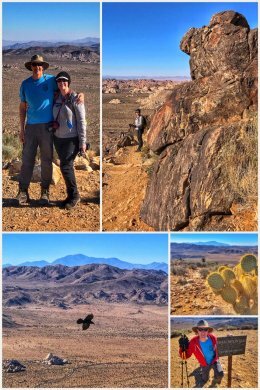 We then hiked the Hidden Valley Trail, a 1-mile loop that winds among massive boulders — in an area once used by cattle rustlers. We ended the day with a wonderful little hike on the Indian Cove Nature Trail, a 0.5 mile hike with very informative interpretive signs. We saved the big hike for the second day… when we tackled Ryan Mountain. We knew the crowds would be smaller and the weather better for this 3.4-mile (RT) strenuous hike up to the 5,438-foot summit. The good news is you get all the hard work done on the way up; the better news is that the views from multiple points along the way — and at the summit — make all the hard work worth the effort! 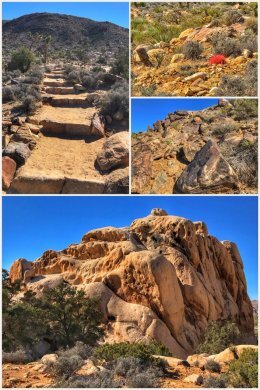 The Ryan Mountain Trail is a combination of many, many, many stone steps that curve up and around to the top of the mountain… with a few flat spots interspersed. It was fun when we hiked back down and saw some of the exhausted faces of hikers making their way up — and we laughed about how we must have looked when we were making our way up. 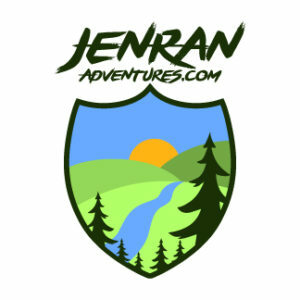 Finally, for geology geeks, the park offers the Geology Tour Road, which provides an 18-mile self-guided tour (on a gravel road that the park recommends driving only with a 4-wheel drive vehicle), with stops that describe the region’s geology. Joshua Tree is the last national park we visit in 2018 — while we take a holiday break with Jenny’s family — but rest assured our visits will resume in 2019, starting in New Mexico.